When I heard that Sheila Lukins passed away a few weeks ago, it prompted me to revisit her Silver Palate Good Times Cookbook, which has been in heavy rotation in my kitchen since its publication in 1985. Along with her writing partner Julee Rosso, Lukins was right up there with Saint Martha, among the first entrepreneurs to cater to working women who didn’t have a lot of time to cook but still wanted to present elegant, delicious food to their families and friends. Silver Palate’s Chicken Marbella probably appeared at more dinner parties than any other recipe in the 1980s and 1990. (It’s good, you should try it!). But of course, the recipe I flipped to first was their spin on mac and cheese. 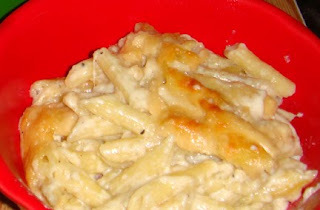 This is the first “Italian style” macaroni and cheese recipe I’ve prepared for blogging purposes, meaning it omits English-origin Cheddar in favor of a quartet of cheeses from Italy: mellow Fontina, melty Mozzarella, nutty Parmesan and my favorite, pungent Gorgonzola. 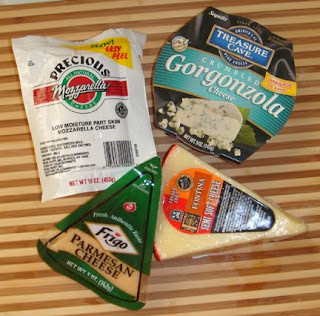 Each cheese contributes something different to the sauce, and I was surprised that none of the individual flavors stands out in the resulting mixture (not even the Gorgonzola – though I used relatively cheap supermarket Gorgonzola – results might vary with really good stuff). The way the recipe is written, it suggests that you might have trouble grating Mozzarella and advises you to cube it instead. My Mozzarella went through the food processor just fine, but the Fontina was too soft for the rapidly spinning grating wheel, so I cubed that one instead. However you do it, just keep stirring after the addition of each cheese to make sure it melts completely. I couldn’t find ziti so I used small, ridged penne. Also, at the last second I realized that my paprika was the smoked variety, which is a very strong flavor I associate more closely with Spain than with Italy, so I didn’t use it. The mixture barely fit into my chosen baking dish, and there was quite a bit of spillage in the oven as the still-loose sauce bubbled merrily over the edge of the pan. Learn from my mistake and either choose a larger dish or place yours on a baking tray, or be standing by with the Easy-Off and rubber gloves. But the mess in my oven wasn’t irritating enough to harsh my mac-and-cheese-induced mellow when this beauty emerged, all crispy on top and oozing cheesy flavor below. I wish I could think of a clever Vesuvius joke to describe the molten goodness, but hey, that’s in southern Italy and this recipe is probably from the north, anyway. 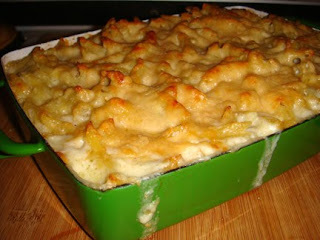 Thanks to the Mozzarella, there is a definite stretchiness to this mac, a real spring to each bite. It’s rich and hearty and just delightful to eat, straight out of the oven. My only possible criticism is that it would be so, SO lovely with a crunchy topping of some kind, a crispy texture to complement the gooey and the stretchy. Next time I will toss on a handful of garlicky breadcrumbs, or if I’m feeling frisky I might try crushing some rosemary and olive oil Triscuits. This mac reheats okay. It’s not nearly as creamy as when it is fresh, but it’s also not an oil slick. But the consistency is so luxurious straight out of the oven, you might want to save this recipe for an upcoming dinner party when it can be consumed completely and urgently by your discerning foodie friends. They will say thank you! And I will say thank you to Sheila Lukins, who inspired so many to taste the exotic and elegant flavors of the world. Prepare the ziti according to package directions, until not quite al dente. Drain. Meanwhile, in a saucepan over medium heat, melt the butter. Whisk in flour and cook, stirring constantly, for 1 minute. Slowly whisk in milk and cook for 1 to 2 minutes, or until lightly thickened to the consistency of cream. Whisk in the Gorgonzola and Fontina. Cook, whisking constantly, until cheeses are melted. Season with nutmeg and salt and pepper. Remove from heat. In a large bowl, combine cheese sauce and ziti. Stir in the Mozzarella. Transfer to the prepared baking dish. Sprinkle with Parmesan and paprika. Bake until bubbling and the top is browned, 25 to 35 minutes. I absolutely love mac & cheese. It's one of my favorite all-time classics. There are a lot of places here in Seattle that serve up interesting mac & cheese recipes. I'll be sure to blog about it when I taste all of them. Wow, I've never seen mac and cheese look so tantalizing! Nice work! I've made this Mac n Cheese and it is fabulous. I'll have to try this -- the Good Times cookbook's chicken pot pie is my ultimate comfort food. (In my edition, the salt measurement is wrong, so caveat saltor.) RIP, Sheila! I've been making this site the late 8p's. My favorite recipe. Such a crowd pleaser, and a surprise too, for non-fans of Bleu cheese....they all LOVE IT!